We live in multi-ethnical, cross-cultural nations, while many of us suffer from an attachment to narrow-minded views of the world. Most of present-day religions have tribal gods in the center of their conceptions of life. In the 19th century, Helena Blavatsky patiently demonstrated that monotheistic gods should not be seen as universal in nature, for they are in fact tribe deities created to serve a local ethos. And even now conventional Western religiosity seldom transcends the limits of selfish forms of deity and worship. The younger brothers of Judaism – Christianity and Islam – have much to learn from Eastern wisdom. Most sects and churches ascribe unlimited power – cosmic and political – to narrow-minded gods invented by their own priests. Due to the history of Jewish nation, the religion of the Hebrews is unavoidably bound to universality; yet much of its structure is still tribal in a sectarian sense. There is a sharp contrast nowadays between the technological advance obtained by our materialistic civilization and the cultural process. While science and technology have made us live in a planetary civilization from the material point of view, we are still slaves to old superstitions of the Middle Ages, from the religious and philosophical point of view. Esoteric philosophy teaches a wide world-vision. It shows the primitive forms of tribalism as unnecessary. It helps spread the seeds of a cross-cultural form of “tribalism”. One of the “social groups” to which we must be primarily committed in theosophy is the whole wave of life on this planet, the worldwide community of living beings. This is our tribe from 21st century on; a small planetary village pulsating in an unlimited, living Universe. If seen as social process, Theosophy relates to the higher level of consciousness in human nature. It enables people to reduce their levels of ignorance and perceive life in more accurate ways. 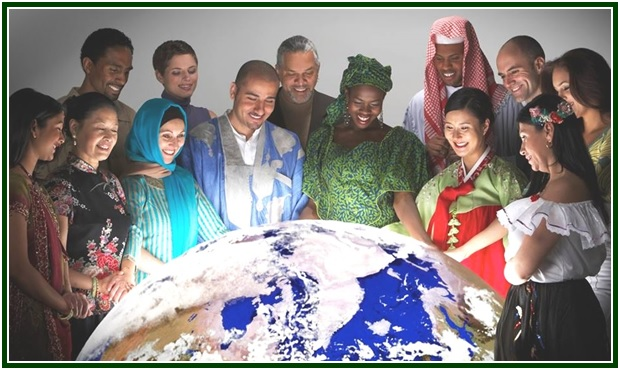 In many a place around the world, the intermingling of ethnic groups is so great that the old forms of tribalism are not possible, but a new and better way to obtain social cohesion is yet to be built. We badly need a “wider tribalism”, a better “sense of belonging to a community which supports us”. The way ahead leads us to a planetary brotherhood across physical, economic and cultural borderlines. Of course, these borders must be respected. A balanced plurality of nations is necessary for international cooperation to flourish. The traditions and institutions of every country have to be preserved. National history and the perceived mistakes of countries need to be accepted, for the specific evolutionary timings of different nations are part of the common planetary heritage. The main condition for such a broad coexistence to endure is that no one can be allowed to attack or to aim at destroying the global community in itself. Balance and diversity must be preserved, as the cross-cultural process stimulates respectful forms of solidarity. In the years ahead, a few obstacles must be removed to grant the common evolution of nations. One of them is religious violence. Since the 1990s Muslim terrorism has emerged as a criminal form of tribalism which no amount of blind goodwill – even if generously stimulated by oil money – can ever be able to legitimize. The battle between terror and democracy, or worship of death and love of life, has some special places where its intensity seems to be the strongest. The Temple Mount, in Jerusalem, has been playing the role of a crucible, among other places, for the alchemical change we need in political and religious culture on a planetary scale. The Jewishness of the Temple Mount is undeniable. At the same time, most Israelis recognize its sacred importance to other religions – Christianity and Islam included. Israel is ready to accept the universality of the place. Yet the energy of respect must flow both ways. When Christian and Muslim nations refuse to accept that Jerusalem is the capital of the Jewish state, they pave the way to terror and anti-Semitism; they thus deny the actual history of Jerusalem and the Temple Mount; they close their eyes to the facts on the ground since 1967. For Jerusalem has been the capital of Israel for quite some time now. How much violence do Christians and Muslims want to see, before they accept reality and support the right of the Jews to live in their own land? Life is contradictory, and the fancy that creates monotheistic deities and “exclusive” gods must not be protected any longer. The world cannot afford a Muslim tribalism of 10 centuries ago whose ill-disguised ambition is to use nuclear weapons in order to destroy Israel and other democratic countries. The tribal right to self-determination deserves acceptance, as long as it does not attack the equal right of other communities. By being helped and preserved, ethnic cultures grow less isolationist and become friendlier to each other. One should not hate, ridicule or criticize them. We must cherish each small community and learn from it. All tribal traditions have something to teach us. The old view of nation-states as entirely separate entities does not make sense any longer. “One for all, and all for one” is emerging as the great rule of life. The concept of planetary brotherhood now becomes the main touchstone of the present century, as well as the next ones. And yet every nation-state has a unique role to play in the music of life, as long as it accepts international peace. The perception that we live in a planetary community cannot replace the reality of local societies. All levels of cooperation, from the village ethos to intercontinental dialogue, must be recognized as important. Universal friendship preserves diversity, and contrast is part of its foundations, for each nation has its own cycle, its beginnings, its highest points and periods of decline. As some lights fade and others get more intense, mutual goodwill is due in all aspects of the planetary garden. An initial version of the above article was published at the February 2013 edition of The Aquarian Theosophist.